The essence of surfing is about discovery and pushing boundaries and Surfing Crete is always looking to offer something new and exciting. Join this premium surf camp and live a luxury surf adventure in Crete. The program includes day trips in some of the best beaches of Chania with Surfing Crete's luxury yachts, surf lessons at the most amazing spots of the island, and tasting Cretan kitchen in the local way! During this surf camp, you will be accommodated in four or five-star hotels. The accommodation is close to the beach and has its own swimming pool. You can surf until late at the afternoon or earlier if someone gets tired. During the day, you can have a lunch break or you can go directly for dinner after the session. The program is really flexible and can be adjusted according to what the group wants. The surf spots in Crete are many so Surfing Crete will pick the ones that are uncrowded and fits better to the level of the group. The goal is to make sure that you will have fun and enjoy surfing in Crete! If you are the surfer that has just entered the amazing world of surfing, Crete is the place that will help you to evolve. The guides will take you to the most friendly spots and help you do the next step. If you are a total beginner, you can have some lessons and by the time you leave the island you will be ready to surf alone and next time join the intermediate level. It is recommended that you can swim well and have an average physical condition. You may be slightly nervous about surfing over rocks or reef however the guides will show you the spots along with the entry and exit points to push your boundaries. Crete has a large, diverse coastline that provides intermediate surfers with a playground of waves to explore. 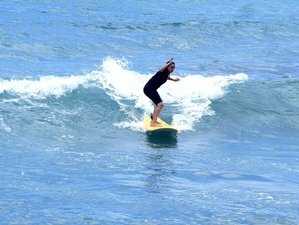 It is recommended that you can paddle into most waves you attempt to catch, turn your board frontside and backside, and understand various wave types, surf etiquette, and possess a reasonable level of fitness. Theaim is to get you the ride of your life in the quietest spots. If you are an experienced surfer who is happy and prepared to travel distances to find the best, uncrowded conditions; if you are comfortable riding reefs and point breaks then the advanced guiding package is for you. There are plenty more waves to be discovered. It is recommended that you can duck-dive well, ride reefs, points, and tubes, and are prepared to travel and take advice from the guides on the day’s best conditions. The aim is to put you in the best conditions with the lightest crowds at the right time. The location of the hotels are closest to Chania town but the surfing lessons and the day trips will take place all around the region. All meals are included in the price. Meals can be done in local taverns and places unless there is another request.